Crunchy biscuits with sunflower and sesame seeds, currants, peanuts and hazelnuts. 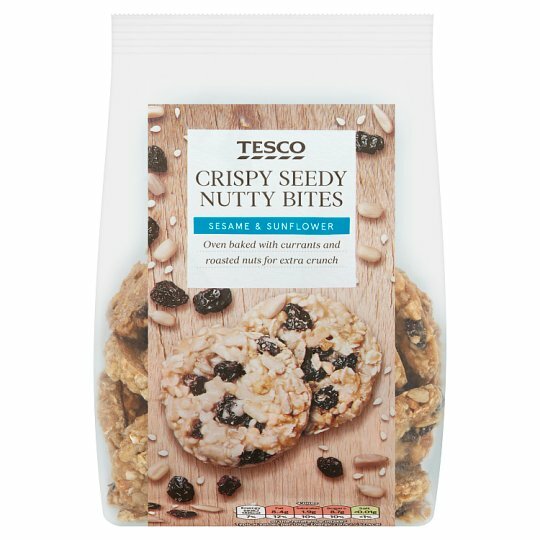 INGREDIENTS: Sugar, Sunflower Seeds (15%), Currants (13%), Glucose Syrup, Peanuts (10%), Sesame Seed (10%), Hazelnut (6%), Oat Flakes, Butter (Milk), Honey, Emulsifier (Sunflower Lecithins), Dried Whole Milk. Also, may contain other nuts, wheat and egg. Wheat contains gluten.. For allergens, including cereals containing gluten, see ingredients in bold.